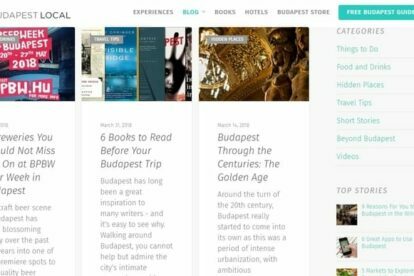 Best Budapest Blogs 2019 - As Selected by Locals! 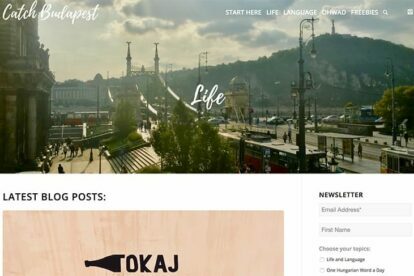 Best Budapest Blogs 2019 – As Selected by Locals! 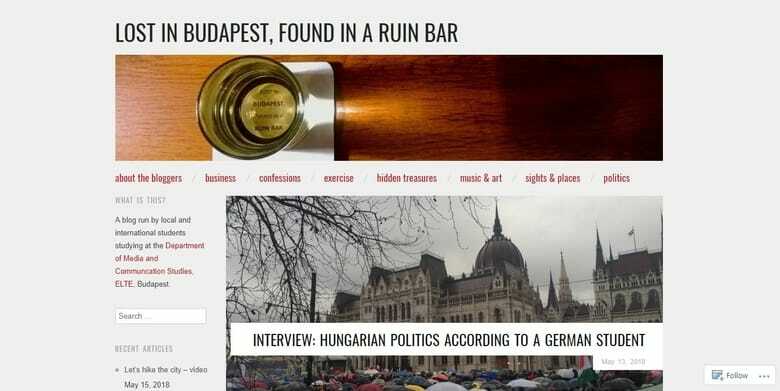 We asked our own Budapest bloggers about their favorite independent Budapest blogs & websites. Here’s a list of their tips in alphabetical order! 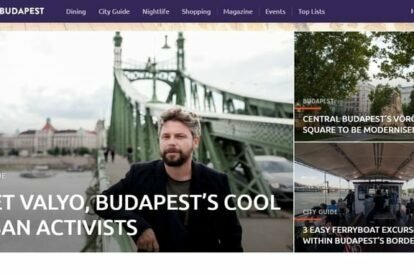 Budapest Local is an online magazine filled with handy tips and spots for when you’re visiting the city, not only the big ones but also great unexpected spots. Their ‘hidden places’ section is definitely worth checking out! They also have great short stories and videos about the city. Catch Budapest is a blog by a young couple living in Budapest. They write about how the city lives, works, eats, drink and functions. 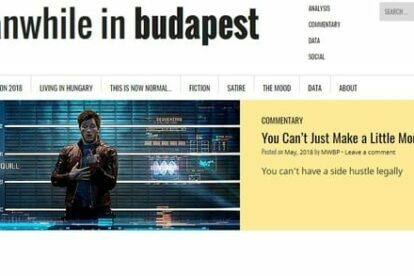 And they’re also trying to bring the Hungarian language closer to our readers (and show them that it’s actually not as difficult as it seems!). One half of the bloggers is a native and the other is learning the language as they’re writing. 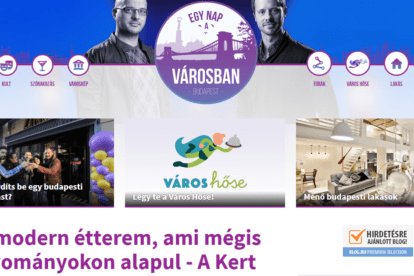 When it comes to Budapest city blogs, Egy Nap a Városban (in Hungarian – translation here) is one of the most well known independent local blogs about the city. The blog was first started in 2010 in an effort to draw more attention to the beauty of this amazing city and has since become quite popular. Városban provides readers with everything one might be interested in checking out while in the city, from entertainment, food, and tours to places to stay and upcoming events. Looking for a fun, contemporary blog that reads like a magazine? Then you should check out Funzine (in Hungarian – translation here), a lifestyle and culture blog by and for the locals of Budapest. Funzine is a blog that promotes and provides new and fresh content in both classic places and new but does so with a hip and modern twist. They provide quality articles that are quick and easy to read on the go. But they also post about places to eat and events to check out when in Budapest. 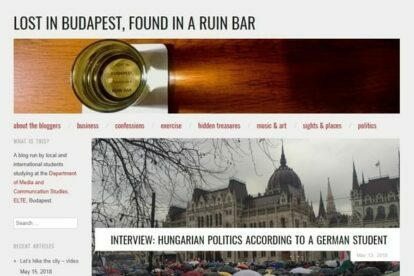 Lost in Budapest, found in a ruin bar is a blog run by local and international students who study at the Department of Media and Communication studies at ELTE. The students give a fresh new perspective on the city because they’re a mix of locals and internationals. The blog features places to enjoy music and art, but also some great hidden treasures. You can also find articles on new start-ups that the students have discovered! Meanwhile in Budapest is a political blog by and about millennials in the city. Millenials in the city grew up very differently than their parents, and are known to have been more optimistic. However many millennials are not satisfied with politics nowadays, this blog features their stories and thoughts. The blog also features good tips and tricks for living in Budapest from a very open and honest point of view. For those of us interested in learning all about the politics and culture of Hungary, this is a blog to keep an eye on. 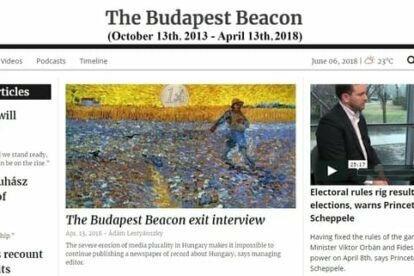 The Budapest Beacon is dedicated to fact-based reporting on the country, and what is happening in it. Although it is not the usual traveler blog, it is interesting to have a read through their many articles. The blog is refreshingly honest and open, and well worth a read. This blog is exploding with spots to eat, drink, shop or simply have fun. We Love Budapest features over 500 (!) places to grab a bite to eat, and they have a very nice system where you can select what kind of food you want and they’ll show you their options. Their whole blog works like this. Want to go sightseeing? Just select the type of things you would like to see. Want to go clubbing? Select the type of bar you want to visit! Easy to use and filled to the brim with places to visit, this blog is a great find for anyone visiting the city. Did we miss any great Budapest blogs? Please let us know at budapest@spottedbylocals.com!